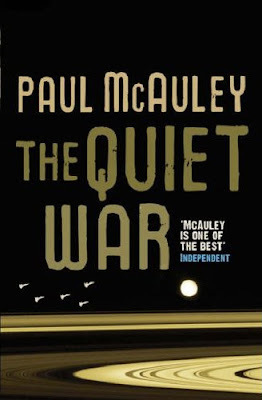 NOTE: You can read the first nine chapters from “The Quiet War” on Mr. McAuley's site which I strongly recommend if you are not familiar with his work. SETTING: In the 2200's, a century after the big “Overturn”—an ecological and social catastrophe that left vast swaths of Earth as disaster areas—Earth is rebuilding under the control of three “Families” that rose with prominence with their “Green Saints”. Religion in the world is mainly dominated by Gaia, although in Greater Brazil it is mixed with traditional Catholicism, secularism in the EU, and traditional Asian doctrines in the Asian Sphere. Dr. Sri Hong-Owen is the top geneticists on Earth—at least in her opinion—and a subordinate of the Greater Brazil powerful Peixoto Family, though as a personal favorite of the family's Green Saint, the elderly Oscar Finnegan Ramos, she is quite powerful on her own. Macy Minnot had a tough life in the slums of Pittsburgh after running away from home. Getting a lucky break by coming to the attention of the Fontaine Family, Macy becomes a soil treatment specialist and crew leader. When she is chosen to represent her lords on an Earth-outer cooperative construction project on Callisto under the leadership of Earth's top engineer Emmanuel Vargo, she believes the job will make her career. Loc Ifrahim is a Brazilian diplomat with secret instructions from his true masters. Dave #8 is one of Sri's secret war projects—a batch of clones altered to look like outers and trained from birth in the arts of war, spying and sabotage—but Dave #8 nurses secret doubts about his humanity and the goals of his superiors. And Cash is a special forces pilot surgically altered by Dr. Sri to pilot one of the new attack warships and is eager for war and teaching the “outer abominations” a lesson. FORMAT/INFO: “The Quiet War” stands at 439 pages divided into five named and numbered parts, each subdivided into small numbered chapters. The narrative is in the third-person, present tense, switching between five different POVs: Dr. Sri Hong-Owen, Macy Minnot, Dave #8, Cash and Loc Ifrahim. The ending is very good and brings together most of the threads in the novel, though it is clear that there is much left to be explored in further novels in the series, the next being “Gardens of the Sun”, expected out in late 2009 from Gollancz. PLOT HINTS AND ANALYSIS: “The Quiet War” is an ambitious novel which succeeds very well at integrating hard sf concepts and tropes—including hands-on habitat development, genetic engineering and vacuum fusion powered flight—with high stakes politics and superb world-building, such as describing Earth’s rebuilding in great physical and socio-political detail. The two main characters in the novel—around which most of the action revolves—are the ambitious and brilliant Dr. Sri Hong-Owen and the practical, down-to-earth Macy Minnot, while the other three POVs add complexity and depth to the book’s intricate tapestry. The vivid description of life on the moons of Saturn and the no-bounds ethos of the younger outer generation stands in marked contrast with the wastelands of Earth, its feudal stratification and the easily stirred mobs incited against “outer abominations”, so we have two very interesting axes of conflict—young and bold/reckless versus old and wise/stale as well as outer diversity and non-conformism against Earth's feudal stratification and required obedience & conformity. Happy to say that Pyr will be publishing the US edition in fall 09. Great news! I hope Pyr will publish the sequel Gardens of the Sun. I am currently reading another superb sf novel that is scheduled only for UK now - Spirit by Gwyneth Jones, Gollancz, December 2008, review to come at some point, and I am amazed at the quality of novels published in the UK that somehow slipped the attention of US publishers until recently. I am about half way through Quiet War ... and what a gem it is. Losing yourself in the amazing, BELIEVABLE, background material, such great, well thought out characters. And of course, the slow slide into WAR, showing the dark side of human (Earth) ambition, their innate need to join the two paths of Humanity (Earth/Moon humans and The Outers) no matter what the cost. A great read, good science fiction is a rare find these days. I cant wait to discover Paul McAuley's other literature.